The new Motus Lab M-Drive features gearless drive design. The design aids in reducing weight and heat, as well as helping reduce the ROI of robots. Applications include use in both the service robot and industrial robot markets. Motus Labs, a designer, and manufacturer of robot actuator and drives for the service and industrial robot markets, today announced a new robotic gearless drive design that uses mating blocks or surfaces instead of traditional gear teeth. The disruptive design was conceptualized developed and patented by CTO/Founder, Carlos Hoefken, veteran robot automation inventor. The Motus M-DRIVE achieves superior performance metrics and eliminates the use of expensive materials and manufacturing processes that drive costs for service and industrial robot suppliers. The combined benefits of reduced weight and heat, high performance, and lower solution cost, dramatically reduce the ROI of robots, providing the ability to open new applications. “It has been decades since there has been a significant new gear drive design,” said Joe Pollard, chief executive officer, and co-founder at Motus Labs. “The Motus M-DRIVE can help revolutionize both service robot and industrial robot markets, with better performance metrics and up to 50% reduction in weight and cost for a critical component in articulated robots,” added Pollard. Articulated robots are found in many industries today to automate processes and are known for their ability to perform repetitive work and often replace humans. The growing service or collaborative market are smaller robots that often work alongside humans. All articulated robots have multiple actuators – a combination of motors and gears, that control positioning and acceleration on various axes. The actuators are the most critical, differentiating and expensive component and are currently relying on old gear technology. The strain wave and cycloidal gear drive designs used today have limitations and require special steel alloys and high-precision manufacturing processes which equate to inadequate performance and high cost. 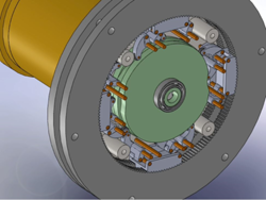 Carlos Hoefken, the inventor of the M-DRIVE, identified an opportunity for a better gear drive. He based the M-DRIVE on principles of kinesiology and kinematics the science of human and non-human body movement. Carlos applied the motion algorithms of a running athlete to the movement of the new gear drive. He designed pads and linkages to emulate the mechanics of hips, legs, knees, and feet of a runner. The simulated legs and feet became low-friction mating surfaces that act like cleated shoes running on the inside of a cylinder, that do not slip under pressure - replacing age-old, brute-force gear teeth. Later, a method was applied to intelligently create and control the movement to maximize torque and minimize slippage and flexing. Carlos designed and developed a cam follower and software tools to produce perfectly optimized motion. “The most expensive part of a robot is typically the gearbox, and I knew there had to be a way to make a device with all the performance benefits – at a lower cost,” said Carols Hoefken, founder and inventor of Motus M-DRIVE. The M-DRIVE performance results in higher torque density, zero backlash, superior torsional stiffness & positional accuracy. All the critical metric requirements for today’s articulated robots. Lower Weight – The design can be built with lighter materials such as aluminum or plastic, resulting in dramatically lower weight actuators. Higher Torsional Stiffness – The improved cohesion of mating surfaces eliminates the elasticity found in conventional drives that slow down and destabilize robots. Lower Cost – The design eliminates the need for special alloys and complex manufacturing processes, resulting in an overall cost reduction of a robot. Higher Torque Density – Provides high torque with less weight, due to the M-DRIVE light materials. High Precision/Zero Backlash – The unique design provides greater position accuracy, no hysteresis loss, and zero backlash. Higher Efficiency – Provides 20-30% higher power efficiency than competing strain wave gearing. Motus Labs launched in July of 2018 with a self-funded seed round and is currently securing a Series-A round. The company has remained in stealth mode while testing the M-DRIVE with early adopters and building-out the leadership team. The new team of highly experienced talent has over 30 years of extensive experience with startups and growth phase companies, including M&A and IPO. “Motus Labs is highly positioned to revolutionize the robotics market or what I like to call – fourth industrial revolution,” said Jim Fontaine, executive chairman, and co-founder at Motus Labs. “We have three key factors for success, an innovative new gear design that can help open up new markets, an established robotic gear-drive market, and an exceptional team to execute,” added Fontaine. Currently, the Motus M-DRIVE will be available in early Q2 2019. For more information regarding M-DRIVE applications, contact Greg Zancewicz, vice president, business development at greg.zancewicz(at)motus-labs.com. Motus Labs is accepting beta customers for M-DRIVE applications. Motus Labs, LLC., located in Dallas, TX, designs, manufactures and markets robot actuators and drives. The Motus M-DRIVE is a new gearless drive technology that uses mating surfaces instead of traditional gear teeth. The initial concept and design are by Founder, Carlos Hoefken, veteran automation, and robotics engineer. The disruptive design achieves superior performance metrics and eliminates the use of expensive materials and manufacturing processes that drive costs for Service and Industrial robot suppliers. The M-DRIVE’s reduced weight, high performance, and lower solution cost dramatically reduce the ROI of a robot and provide the ability to open new robotic applications. Learn more about Motus Labs at, http://www.motus-labs.com. Motus M-DRIVE United States Patent – 9,261,176 B2, Issued Feb. 16, 2016. Motus Labs, the Motus Labs logo and M-DRIVE are all registered trademarks of Motus Labs, LLC.